Shoe boxes are perfect for tidying up and keeping your home looking shipshape for next to nothing. Whether you’re neatening up wires, creating some cheap-as-chips artwork or building some much needed extra storage, we have some smart shoe box tips and tricks, perfect for using up those pesky shoe boxes you no doubt have lying around at the back of your cupboards. As experienced bad credit mortgage brokers, our team know just how important it is to save your household pennies wherever you can, so why not crack on with these 6 smart ideas to start saving? Is there anything worse that unsightly wires cluttering up your favorite space? We don’t think so. 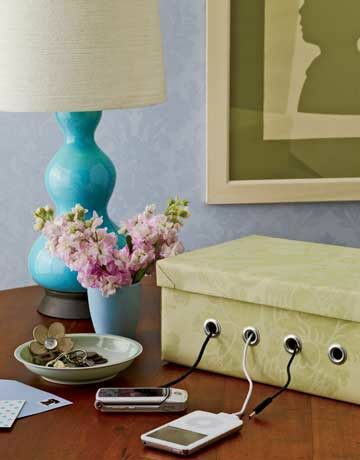 This clever shoe box wire tidy is the perfect free and easy way to keep those cables neat and tidy. Simply pop your holes in the right places, stick a gang plug with your chargers into the shoe box, give the whole contraption a little razzle dazzle and – there you have it! No more nasty wires. Décor feeling a little drab? Here’s a super inexpensive way to turn shoe box lids into eye-catching artwork with the help of some pretty paper, you can even use old magazines. Get the full tutorial from crème de la craft! Another fabulous project from crème de la craft, this time using the body of the shoe boxes to create cool little wall shelves for displaying your knick-knacks. You won’t want to pop a treasured family heirloom on these shelves, but lightweight bits and bobs look lovely! Want a stylish storage look but don’t want to splash out? Transform shoe boxes into classy containers with some rope and glue! This simple tutorial from the Gilded Hare will show you precisely how it’s done. When your cables aren’t all plugged in to your pretty new wire organizers, shoe boxes are also perfect storage spots for loose wires. Collect loo rolls and pop individual cables into each one. Store the lot in a shoe box and everything will fit perfectly. No more tangles and tantrums when you can’t find your charger! Transform old shoe boxes into stylish storage with the help of old winter jumpers. Either use jumpers that are beyond repair or take a little look through your local charity shops to find some real bargains. Then use Organized 31’s great tutorial to put it all together. Do you have any smart shoe box storage ideas or household money saving tips? Why not share them with our readers below? In the meantime, if you’d like some money saving tips of your own to help you find your new mortgage, call our helpful team today on freephone 0800 9777840.